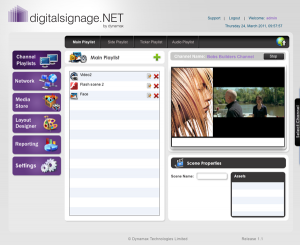 We are pleased to announce the release of digitalsignage.NET version 1.4– our digital signage software designed for small and medium enterprises. The latest version includes new features and fixes the documented bugs. This version, just like the previous one, is based on Amazon’s cloud solution EC2. 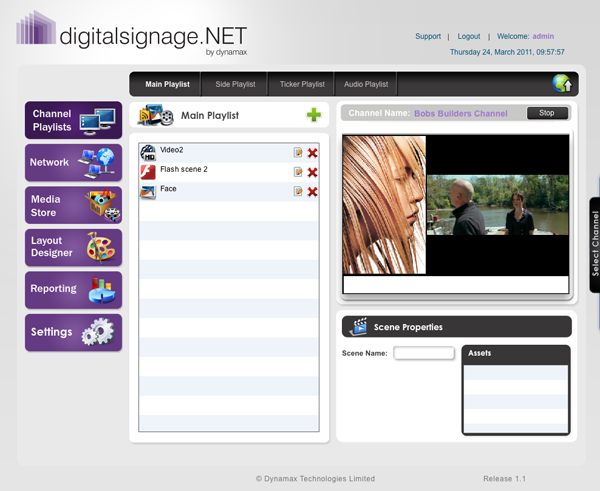 The cloud- based feature of digitalsignage.NET means that the user doesn’t have to worry about storage, band-width, backing up of data or server management (involving highly skilled IT staff). We’ve increased our capability in interactivity by providing our users with the possibility to share Twitter updates with their audience (by adding Twitter feeds within the system). Other RSS feeds are supported as well. Layouts now have a Z order with ‘Bring to front’ & ‘Send to back’ support. Comment and suggestions welcomed. Enjoy!